I remember picking up the very first issue of Swamp Thing in 1972 at the bookstore in Anchorage, Alaska. It was a classic horror tale and I was intrigued how this misunderstood monster would carry an ongoing title. But it did, and the first 10 issues by Len Wein and Berni Wrightson were classic Silver Age horror tales. I became a fan of Berni Wrightson for life after that. I longed to see Wrightson return somehow to his greatest creation. In 1977, DC started re-printing some of their classic work in double sized "DC Special Series" comics. 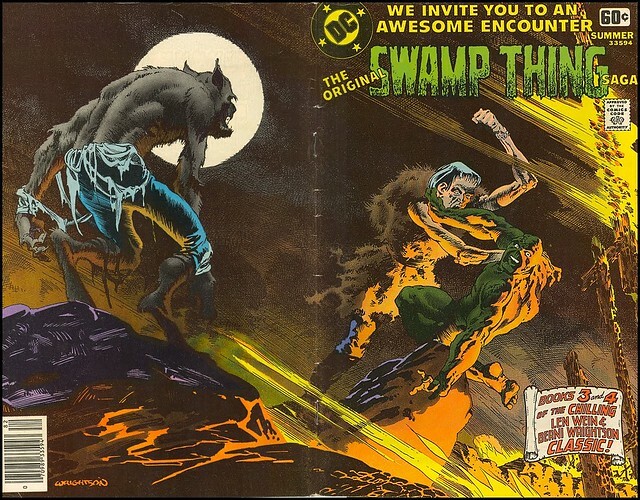 The first reprint issue featured this glorious wraparound cover by Wrightson. 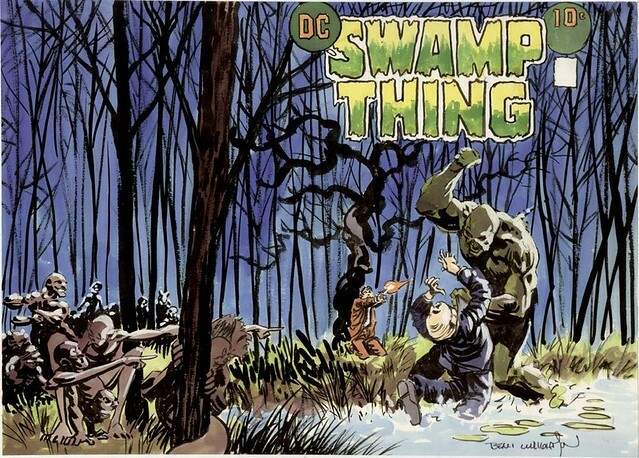 Featuring Swamp Thing battling Anton Arcane in the Louisiana bayou while Arcane's Un-Men watch with vengeful delight. Everything about this illustration knocks me out. The detailed pen and ink rendering of Swampi, Arcane, all the other figures and the trees are superb. The composition of the 2 main figures in the foreground, with Matthew Cable firing at Swampi in the foreground, draws in the viewer's attention. The color, by the way, is also exquisitely done. The light source is the moon off to the right, shining on Swamp Thing's back. I already had the original issues when this was published. I bought 2 copies just because I thought this cover was such a masterpiece. Here is the preliminary study that Wrightson did for this cover. 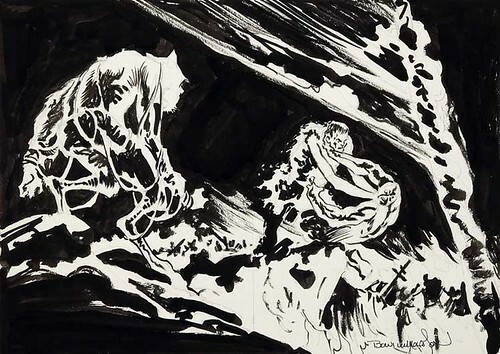 The prelim is also very good and I was surprised at the amount of work Wrightson put into this piece, which I found at Swamp Thing Roots and Stephen Donnelly's Comic Art Fans page. See below for links to all sources. It took DC Comics a few months to continue the reprints, but in 1978 the second one appeared, with this Wrightson wraparound featuring the Patchwork Man and Werewolf. These 2 characters appeared in separate stories and putting them in the same scene is a bit of a stretch. I like this cover, too, but not as much as the first one. Here's the prelim for the second cover. which I also found at Swamp Thing Roots. 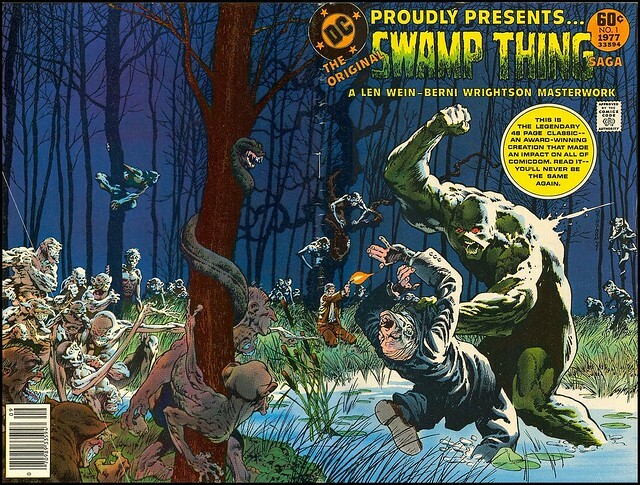 DC Comics continued reprinting Swamp Thing, but stopped commissioning new Wrightson covers. Has there ever been any new Swamp Thing illustrations by Wrightson after 1978? Please let me know. Nuff Said! Fantasy Ink, Swamp Thing Roots (lots of neat pencils and unused covers here), Stephen Donnelly on Comic Art Fans.